The ASSURED project aimed to radically transform the secure access to health data in the UK and, as a result, accelerate innovation within the healthcare digital supply chain. The outcomes of ASSURED will speed up the process by which new digital services are adopted within healthcare and will simultaneously reduce security risks associated with the management of personal health data. The project combined N3 aggregation, security risk modelling and device compliance and monitoring techniques to create a new platform supporting the entire process covering application, assessment, approval and connection of services to the N3 network. Our work in this project has continued in the SHiELD (cross-border e-health) and RestAssured (Cloud data security) projects. 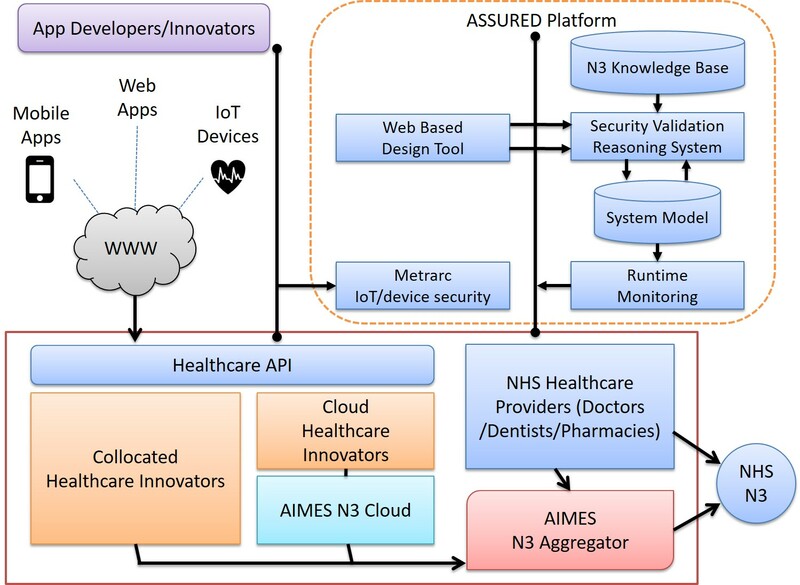 A key aim of the ASSURED project was to reduce the time to approve the connection of digital services to the NHS network by an order of magnitude from up to a year to around one month. This was addressed via network modelling, assessment of threats via a knowledge base and by performing integrity and compliance monitoring. The image below gives an overview of the ASSURED platform. a modelling tool that makes the certification process easier by providing features for the collaboration between system designers and the certification authority. This work originated from previous projects, such as SERSCIS and OPTET, and is also extended in more recent projects such as 5G-ENSURE (mobile network security), SHiELD (cross-border e-health) and RestAssured (Cloud data security). The ASSURED project was a 21 month project funded by Innovate UK. This project has received funding from Innovate UK.